Half the battle of writing a great book is getting the reader to emotionally invest in your story. The most successful form of this sees the reader caught up in the moment, and it’s an experience that we’ve tried to catch again and again in the language of clichés. A great tale leaves you on the edge of your seat or sends a chill down your spine – it’s a rollercoaster ride that forces your heart into your mouth. A great story is, in short, something that happens to you. It makes you feel things not generally or in retrospect, but as immediate and personally relevant. Having this effect on the reader is difficult, and there are no shortcuts, but there are certain emotional responses that are easier to trigger than others. That’s where the uncanny comes in. As ever, we’re dealing with concepts that would take years of study to really nail down. Thankfully, we’re looking for effective writing tools, not transcendental understanding. Originating in the world of psychology, the uncanny is most often associated with Sigmund Freud, who attempted to explain and codify the experience. In the modern day, the uncanny is understood as the experience of finding something strange or upsetting based on its close divergence from the familiar. Freud focuses on the idea of inverting the ‘homely’ – the uncanny isn’t merely strange, it’s also familiar, just missing being mundane and comprehensible by the slightest margin. Imagine your parent opening their mouth and hearing someone else’s voice come out. That’s uncanny. The uncanny is that class of the frightening which leads back to what is known of old and long familiar. Mastering the uncanny therefore allows you to provoke discomfort in the reader, ranging from a mild worry to full-blown fear. It’s ideal for horror writers, but it’s also useful when working in other genres, especially those that deal with life-or-death struggles. In a murder mystery, the uncanny can guide the reader’s suspicions even without concrete evidence, whereas in a fantasy or sci-fi story it can imbue a sense of the genuinely alien. There’s a fantastic moment in Stieg Larsson’s Millennium series where the protagonist is invited inside by another character. They know, instinctively, that it’s not safe, the sense of the uncanny is powerful, but it’s not quite enough to dissuade them. They, and the reader, know it’s a mistake even as it’s happening, and the sense of dread and danger that are evoked are incredibly powerful. The uncanny has a lot of uses, so what can you do to make it work for you? The uncanny freaks the reader out because it isn’t quite right – it taps into our understanding of the world and patterns around us and renders them slightly ‘off’. This is what makes the uncanny more versatile and more difficult than other types of reader discomfort. You can describe a murder scene to the reader or tell them a werewolf is coming to get them and you might get a reaction, but it won’t get quite as deep, because they’re not part of the process. With the uncanny, you persuade the reader to start interrogating the patterns around them, and the discomfort unspools from within their own mind. Subvert the familiar in a way that leaves it recognizable. One huge advantage writing has when creating the uncanny is that the reader is generally already feeling the safe homeliness that will need to be inverted. The act of reading is pleasurable, the reader has picked up a book and is enjoying it – they’re feeling safe. 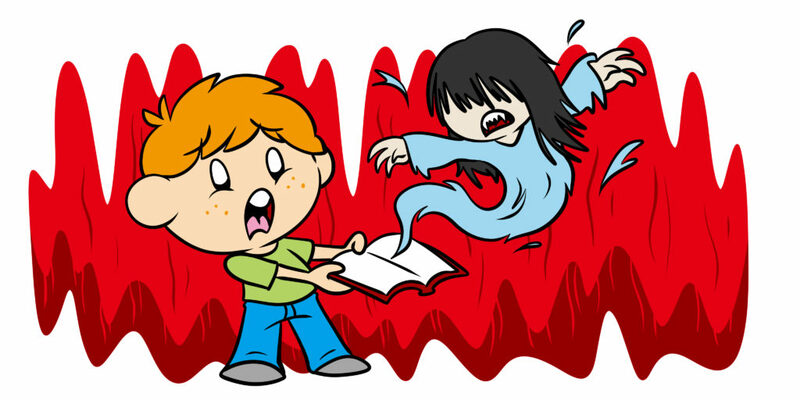 To reach out from that book and disturb them is already an uncanny act. Some authors have used this fact to great effect. In House of Leaves, Mark Z. Danielewski includes a passage that’s freaked out many a reader. To get a better idea try this: focus on these words, and whatever you do don’t let your eyes wander past the perimeter of this page. Now imagine just beyond your peripheral vision, maybe behind you, maybe to the side of you, maybe even in front of you, but right where you can’t see it, something is quietly closing in on you, so quiet in fact that you can only hear it as silence. Find those pockets without sound. That’s where it is. Right at this moment. But don’t look. Keep your eyes here. Now take a deep breath. Go ahead take an even deeper one. Only this time as you start to exhale try to imagine how fast it will happen, how hard it’s gonna hit you, how many times it will stab your jugular with its teeth or are they nails?, don’t worry, that particular detail doesn’t matter, because before you have time to even process that you should be moving, you should be running, you should at the very least be flinging up your arms – you sure as hell should be getting rid of this book – you won’t have time to even scream. Here, Danielewski doesn’t just invoke the uncanny – he also preys on a natural instinct we have to check around for danger. This is a big part of writing the uncanny; picking out ways in which we’re prone to worry and then encouraging us to do so. Like telling someone to be aware of their breaths, or how big their tongue is in their mouth, part of the trick is simply knowing the thoughts we tend to dwell on. Tell your reader that someone’s standing behind them, or that there’s a demon that intends to jump on them when they’re next in the shower, and you’re already tapping into spaces where their instincts have an advantage over their intellect. The trick is to play into this awareness of the process. The uncanny is, in part, the uneasy process of assuring yourself that you’re safe, even as that feeling at the back of your neck tells you you’re not. It may seem brazen to get involved with this process, but with a little skill, it can actually make your writing more effective. Notice, for example, how Danielewski explicitly mentions the book, telling the reader to get rid of it. This is a deft move because it plays into the reader’s understanding that it’s really the book that’s making them uneasy. An ordered mind thinks, This book is making me feel uneasy, but Danielewski perverts that understanding, turning discarding the book from an obvious and total solution to just a precaution against something that’s now outside the reading experience. This idea of undermining the reader’s understanding of the book or story itself is one that can often yield results. Richard Kadrey’s ‘The Secrets of Insects’ begins to get seriously creepy when a character admits he can’t remember where he was before the story began – the reader is asked to assume the presence of backstory and then uncannily prompted to reconsider. To encourage a reader’s sense of the uncanny, your purpose shouldn’t be to scare them or persuade them that something’s wrong, but to keep encouraging them to check. Keep them trapped in the process of checking and rechecking. Part of the brilliance of the Millenium series scene I mentioned earlier is that it puts the reader in a process where they’re interrogating the potentially dangerous character’s every word and action. They seem dangerous, but are they? Did that just prove they are? Did that just prove they’re not? The eventual reveal of whatever consequences await the character more or less puts a stop to a sense of the uncanny. Either the house is safe or it isn’t, either their partner has been replaced with an alien or not. For the uncanny to really land, the reader should feel that normalcy can theoretically be regained – that it’s just within their grasp. Alfred Hitchcock, a master of the uncanny, said it best. So if you want to write the uncanny, where do you start? Well, as should be clear by now, the uncanny is bound up in the homely and the safe. To begin writing the uncanny, identify a place where you character and your reader would usually feel safe. Anywhere within the home is usually a good bet, but being surrounded by people, or in some other way ‘protected’, makes the suggestion of inherent danger more unsettling. This also applies to the source of the danger. This is part of what’s behind the preponderance of child ghosts in horror – if you can successfully turn something non-threatening into a threat it gains a degree of the uncanny. It’s a common joke that, in Stephen King’s lazier writing, he simply chooses a random object to imbue with supernatural purpose and horror. It’s not an entirely unreasonable claim, but it misses the point – King instills everyday items with horror because it’s a direct line to the uncanny. The next step is to remember that surety has a way of killing off the uncanny. Be sure to tease out your characters’ understanding of what’s wrong. As soon as they know for certain, you’re undercutting the uncanny. For example, consider the sense of unease created by Danielewski’s passage. Either something’s behind you or it isn’t. If it is, the sensible reaction is abject horror, and that’s an emotion that the reader isn’t going to feel as strongly. They can appreciate the character’s experience of it, but they can’t feel it for themselves in the way they feel the uncanny. Build up to the reveal of what’s really going on, and take your time about it. Remember that the key is to keep the reader reassuring themselves, and they need space and reason to do so. Offer sensible explanations for unsettling events and take advantage of the fact that, given the slightest reason, they really will expect things to work out alright. When you do finally reach the reveal, consider laying it on thick. If the reader is going to be disabused of a comforting explanation, it makes sense to really pull the rug out from underneath them. For perhaps the best example of this, check out the diner scene from David Lynch’s Mulholland Drive. In this scene, a man has called his friend to a diner. He’s been having terrible dreams about encountering an apparition in a nearby alley, but having resolved to go confront it, he daren’t go alone. The friend follows him as he inches closer and closer to the fateful spot, the camera crawls around the corner, the sound becomes echoey and unnatural and… the apparition actually appears! The situation is exactly as bad as the man feared it would be, and it takes the viewer completely by surprise. Yes, they felt worried, but they’d been assuring themselves that things would be okay. Another effective technique is to build levels into the source of the uncanny. Cosmic horror is effective because it’s based on the concept that the very nature of reality isn’t what we believe it to be, and this belief leaves a lot of room for different levels of the uncanny. On the first level, the reader wonders if there’s really a monster in the house. It turns out there actually is. Now, they’re wondering if this was a one-off. It turns out it wasn’t; there are monsters in many hidden places. Now, they’re wondering if things will turn out alright. It turns out they won’t; the world is not what they thought it was. You don’t have to go this far, but it’s useful to know that the reader will always be pulling themselves back from admitting how bad things could be. They instinctively want things to be alright, so it can be really effective to help them keep that hope alive. Finally, do your best to have the character’s experience mirror that of the reader. When they’re suspicious, worried, and reassuring themselves, they’re speaking for the reader, and that’ll only increase their emotional investment. In psychological terms, I’ve only scratched the surface of the uncanny here (though at least that spared us having to discuss the differences between the ‘heimlich’ and the ‘unheimlich’), and further research will, as always, result in a greater understanding. Drawing on the uncanny is a great way to forge an emotional connection between the reader and your work that’s as powerful as it is direct. The more you work on using it, the more subtly and effectively you’ll be able to do so. Are there any moments of uncanny media that are still with you? Let me know in the comments. Or, for more great advice on utilizing the uncanny, check out How Understanding Cosmic Horror Can Improve Your (Love)Craft and 10 Facts That Tell You How To Use Tension In Your Story. Thanks for flagging this. It’s part of a larger issue that we’re currently addressing, but I’ve removed the tweets for now in favor of clarity. Thank you so much for sharing your knowledge, Robert. My pleasure – thanks for the kind words. Is any chance of you expanding upon this artikel, making it a series, maybe? Absolutely – we always aim to cover topics authors want to know more about. What further information or insight would you want to see covered in an expanded series or follow-up article? I loved this article too and would like to see a follow up article. In particular I would like to know more about how the familiar becomes uncanny and I’d like more examples please. The quote you used was effective but it broke the wall and I’d like to see other examples. I confess I’m confident that “Janr Eyre” uses the uncanny but I’m too ignorant to understand the techniques Bronte used. Or maybe the uncanny aspect was the weakest part of the novel – I don’t know. In any case I’m sure it will help me craft my fantasy novel- I’m trying to disconcert my readers. I’ll definitely look into expanding this topic, then. In the meantime, we’ve got something coming up on ‘doubling’, which has a close relationship to the uncanny. Dreams might be a good angle from which to approach other aspects of the uncanny… Watch this space. This is very helpful information for he book I’m writing now. A very interesting and useful article as always, Rob. Thanks a lot for sharing! My pleasure – thanks a lot for saying so. This is helpful. I’m always trying to figure out ways to have my readers feel emotions. Thanks for commenting; I’m really glad it was useful.